On Thursday evening the participants were officially welcomed to Kupang at a dinner at Teddys Bar hosted by the Lord Mayor of Kupang Mr S. K. Lerik. The evening began with a number of traditional dances and performances from Timor and the surrounding islands followed by presentation of awards and then dinner. During the following days many of the crews left on tours exploring the hinterland while some explored the bars and variety of restaurants in the town and surrounding areas. 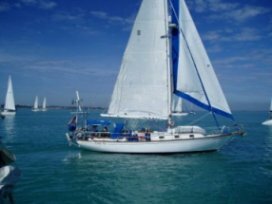 Adagio of Lorne, a 37 foot British yacht skippered by David and Anne Meaning, and Delight, a 34 foot Dutch yacht skippered by Henri Teunissen, arrived safely in Kupang at 2200 hours last night (Friday). 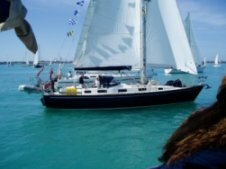 They are the final participants in the 2005 Darwin Kupang Yacht Rally to arrive in Kupang, having had a delayed start from Darwin on the previous Tuesday. At the morning sched, both yachts were awaiting customs clearance prior to going ashore and catching up on some of the celebrations that the rest of the fleet has been enjoying. 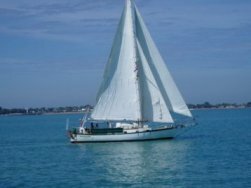 Neeltje, a 34 foot British yacht, skippered by David Ross arrived in Kupang at approximately 2000 hours last night (Thursday). Neeltje’s arrival coincided with a large party amongst the fleet in Kupang which went into the early hours. A slow start is expected this morning!! Adagio of Lorne and Delight continued to make good sailing progress towards Kupang overnight, covering some 86 nautical miles. At the morning sched, Adagio was positioned at 124° 41’ E and 10° 42’ S and Delight was nearby at 124° 47’ E and 10° 39’ S. Sailing conditions had moderated slightly overnight to a light breeze, but Adagio reported they were continuing to make 5 knots over the ground. At the current rate of progress, both yachts are expected to arrive in Kupang very late tonight or early on Saturday morning. At the 1615 sched today, all yachts in the fleet, except three, had arrived in Kupang and were commencing their celebrations. Yachts still to arrive include Neeljte which was 120 nautical miles south east of Kupang at the morning’s sched. Adagio of Lorne and Delight who had delayed starts from Darwin on Tuesday were situated at 128° 11’E 11° 38’S and 128° 12’E 11° 37’S respectively at the 1615 sched. They reported little wind during the day. Most of the 70 strong fleet have now either arrived in Kupang or will reach there today. Back-markers in the fleet, Adagio and Delight, (who left Darwin on Tuesday morning following technical difficulties) reported their position this morning at 128° 58’ E 11° 52’ S, with no wind. Neeljte was reported at 125° 31’ 11° 11’ by Kupang radio. Yachts expected to finish before this afternoon’s sched include: Aegir Navis, Aeolus XC, Avalon, Cap D’or, Deliverance, Fortuna, Freebird, Moonshadow (Sandefur), Norma Ann, Santa Maria II, Sunshine and Tien Fei. On the morning radio sched two yachts from USA finished overnight - Moonshadow (Backhus) and Imagine. Sailing conditions had improved by morning with the fleet experiencing 15-18 knot winds and calm seas. The afternoon radio sched showed that ideal sailing conditions had been experienved all day with an easterly breeze of 10-15 knots whith many yachts were taking full advantage of with their spinnakers. A number yachts finished during the day - these were reported to include Adriatica, Augusta, Djarrka, Lady Emma, Lurline III, Mariah, Miclo III, Pacific Bliss, Simpatica, Suleika, Sunchaser II, and Sundancer II. More are expected to finish overnight. Yachts reported to be approaching Kupang at the time of the afternoon sched included Argonauta, Explorer, Ichi, Layaleeta, Mar Bella, Quo Vadis Mana, Quoll II, and Spicy Lady. The remainder of the fleet is strung out over about 100 nautical miles east of Kupang and are expected to arrive within the next 24 hours (if the current conditions prevail) with a few late starters coming in after that. On the 1600 sched the 62 foot Moonshadow was 50 miles from the entrance to the Roti Strait soutg of Kupang and expected to finish at 9 pm Darwin time tonight , the rest of the fleet were still sailing in very light winds with some yachts occasionally becalmed and having to resort to the "iron spinnaker' the rest of the fleet were behind with Mi Gitana, Nepenthe, Santa Anna, Remedy and Medusa almost is sight of one another. 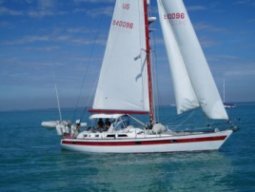 Singapore registered Tien Fei and Fortuna from the United Kingdom were still fighting it out for last place with 220 miles to go. 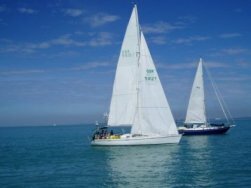 The yachts started on schedule at 11 am in Darwin harbour from the Darwin based converted pearl lugger the Anniki. They set off under a light overcast sky in very light winds. First across the line was Sundancer II skippered by Ian Potter. 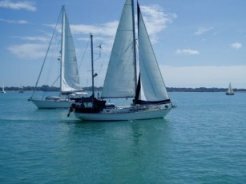 At the 4 pm radio sched all the yachts were grouped together 35 miles from Darwin in a light breeze of 10-12 knots looking forward to a quiet night.